Part of that enjoyment comes from the benefits of dancing – both physical and mental. It pumps up our cardiovascular system, energy level, immune system and musculature. It reduces weight, stress, stiffness and symptoms of depression, and it provides a like-minded social circle. Yes, a workout. And whether you’re inspired to learn some new dance moves because of TV shoes like Dancing with the Stars or you think you have two left feet, Cabarrus County has sources that will teach the correct way, utilizing exercises to prepare the body for the rigors of dance. Positively Ballroom Dance Studio has been a fixture on Union Street in downtown Concord since 2010. Formed by combining their Locust, Albemarle and Indian Trail locations, owners Ryan and Mary Knight are both professional dancers. Ryan has more than 25 years’ experience as a professional ballroom and Latin dancer while Mary has training in ballet, tap, jazz and modern dance. Knight breaks down what he sees as the biggest advantages to dance. “Flexibility is an important part of being healthy. I learned many years ago that having strength without flexibility provides you with a very stiff body prone to injury. Dance requires a great amount of flexibility, especially in the back and legs. Dancers must strive to achieve a wide range of motion for all of the major muscle groups. A greater range of motion means that more muscles can flex and extend. Dances like the tango and bolero are good examples of dances that require bending and stretching. “Dancing builds strength naturally by forcing the muscles to resist against a dancer’s own body weight. Many styles of ballroom dance, like the waltz, rumba and swing, require participants to build up their leg muscles to perform the dance properly. In the same way, holding a frame properly also requires dancers to build up their back and core muscles. “We all know that exercise helps increase your endurance. Regular dancing is great for improving endurance, especially vigorous dancing such as swing, salsa and cha-cha. “Doctors have stated for years that regular physical activity can help keep your body, including your brain, healthy as you age. Exercise increases the level of brain chemicals that encourage nerve cells to grow. In that same regard, dancing that requires you to remember dance steps and sequences can boost brain power by improving memory skills. A study published in the New England Journal of Medicine found that ballroom dancing at least twice a week made people less likely to develop dementia. Research also has shown that some people with Alzheimer’s disease are able to recall forgotten memories when they dance to music they used to know. Knight also points out the importance of pre-dance warm-ups. “It helps the body become prepared to move faster, make larger movements, jump and bend. Simply stated, a warm-up causes the temperature of your body to rise, which in turn pushes blood to your muscles and helps lubricate your joints. All of this contributes to a reduction of injury due to your body being revved up and ready to move. “Every dance style has its own focus and discipline, so to say that one style is better than another is like comparing apples to oranges. In the end, they are both fruit and it simply comes down to which you prefer at the moment,” he says. Jerilyn McDonald is also a professional dancer. Then, in May 2015, she stepped into professionally teaching others how to shimmy and shake. That’s when she became a Planet Ballroom franchise owner and instructor at the Concord location in Afton Village. She also “dances” her way to the Matthews and Asheville Planet Ballrooms and back. 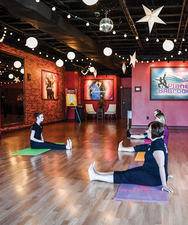 Planet Ballroom and its certified professional instructors utilize a health, dance and fitness method called PB FIT and its Burn, Tone & Flex™ method. “We have complimentary flex, tone and cardio fitness classes that prepare our clients for dancing,”McDonald says. “Young people may want to burn calories, we have couples getting ready for their wedding or using this as their date night, and overweight people wanting to get physically fit. We have dancers as young as 10 and as old as 89. Classes are geared toward people of just about any age, with or without a dance partner. Its dances fall into three categories: ballroom, Latin and swing. Choices are often related to the dancer’s goal, whether it be dancing for fun and enjoyment; competition; health and fitness; or special events. McDonald agrees. “People come straight from work, happy and ready to be here. It’s a stress reducer,” she says. 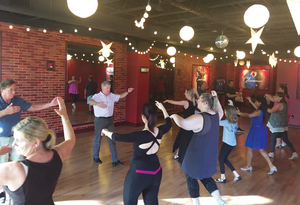 Regardless of where you see learning to dance, both studio owners agree that making the decision to try ballroom dancing might be the toughest, but the journey is worthwhile. “I think people that are hesitant just need to take the first step and come see the studio. Once they get started, they’ll find that our instructors are patient so that everyone can benefit,” McDonald says.